“My skin is kind of sort of brownish pinkish yellowish white. My eyes are greyish blueish green, but I’m told they look orange in the night. My hair is reddish blondish brown, but its silver when its wet, and all the colors I am inside have not been invented yet.” Shel Silverstein, Where the Sidewalk Ends. Visit any elementary school classroom and most likely you will find a copy of Shel Silverstein’s Where the Sidewalk Ends. It was one of my favorite books during my younger years. I enjoyed reading the short poems chock full of words that sounded like music to my ears. Since next month is National Poetry Month, I wanted to share some poetry lessons with you. Poetry is not included in the Common Core Writing Standards. However, it is in the Reading Standards, and we at WriteSteps think it is beneficial to have students try their hand at writing some poetry when you can fit it in. Here are some ideas of how you can incorporate poetry in your classroom. Feel free to modify and tailor them to your students’ learning levels and capabilities. 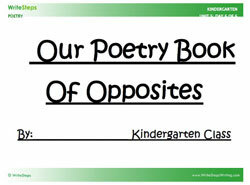 The lesson and visual aids provided allow you to create a class book of Opposite Poetry. You’ll introduce opposites/antonyms and your students will use the handout (provided) to create sentences of Opposite Poetry using two antonyms. You will introduce or review opposites/antonyms and model an example for your students. Each line of poetry will go on a new page with the illustration. Sample: Big is a big big skyscraper. Little is a little little penny. Have your students choose their opposite words and create their own lines. Once they are done, staple the finished work together with the provided cover to create a class book! Click on the title or the photo to get your free lesson. 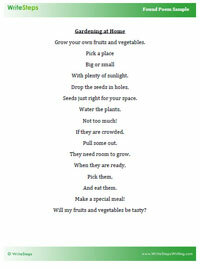 Creating a “Found Poem” is a Non-Fiction Response Writing activity. Students use the facts they find in a non-fiction piece to create a poem. This lesson can be used for grades 1-5 because you have the flexibility to choose an article for any reading level. The sample currently chosen is of a lower reading level. Click on the title or the photo to get your free lesson. When you open eWriteSteps, you will now see a new tab, before Pre-Unit 1. It’s labeled PD On-Demand. Click it and you will see that there is currently one listing, Kickoff. This 45 minute presentation provides an orientation to WriteSteps. You can choose to watch the video and/or download a packet of material pertinent to the kickoff video. We are excited about this addition, because it is just the first step. There will be more PD On-Demand videos coming soon! Some will be free, like this one. Some will be available for purchase. Topics will include Getting Your Classroom Ready for Writing Workshop, Writing Conferencing, Formative Assessment, and more. It is important for us to offer this kickoff video, because we want all teachers new to WriteSteps to have a thorough orientation to the program. It’s also helpful for teachers who want a refresher course on how to use WriteSteps. We truly hope you will take advantage of this new offering as we continue to add on and improve our product. Our goal is to support you in every way possible. Our K-5 writing program, WriteSteps, is used and promoted nationwide in public, private, and charter schools. We would like to have enough consultants that each could work in his/her own regional area. For this position travel is a necessity. We would also like to add coaches who are not required to travel. We do quite a bit of virtual professional development and would like to add a “virtual coach” to our team. If you are interested in learning more about our company and our writing program, visit our website, WriteStepsWriting.com. If you are interested in applying for a position, send a resume to Arlynn King at [email protected]. We will contact you shortly after the receipt of your information. A WriteSteps Coach is sometimes called on to travel throughout the United States to provide professional development for schools that have purchased WriteSteps. A Coach can also be required to deliver the PD virtually. Meet with (virtually and/or in-person) small groups of teachers (usually grade-level groups) and facilitate coaching sessions – These may include such topics as: teacher Q&A, pacing, management, lesson presentation, modeling, conferencing, assessment, formative assessment, scoring using the rubric, etc. 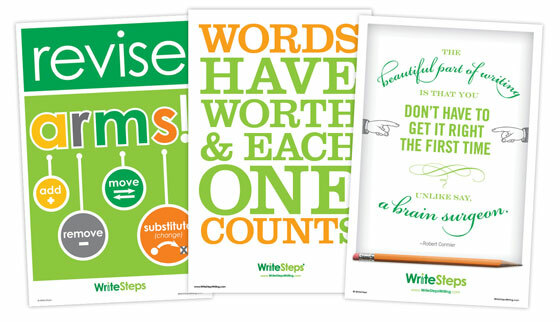 Hang these posters in your classroom to share the importance of revision to your students. Stop by the WriteSteps booth at the Georgia Compensatory Educational Leadership Conference and say hello to Marilyn Massey. She will be able to answer your Common Core Georgia Performance Standards questions! WriteSteps will be at the Massachusetts Title 1 Conference in Marlboro, MA. Awareness Ambassador Ed Rock will be there to answer any questions you might have. Are you going to be at the Missouri Association of Elementary School Principals Conference? If so, say hello to Awareness Ambassador Ben Kutz and learn more about our K-5 writing and grammar program. Our National Presenter, Kim Gates, will be in Raleigh, NC at the North Carolina Reading Association Conference. Don’t miss her presentation, “Unlocking the Door to Writing Success” on March 15 from 12:30 P.M. to 3:00 P.M.
WriteSteps will be at the California Charter School Convention in Sacramento, CA. Stop by the WriteSteps booth to say hello and enter for your chance to win a free one-year trial of eWriteSteps! Awareness Ambassador Herman Humes is going to be at the Michigan Association for Computer Users in Learning Conference. Find out how you can use the digital features of eWriteSteps to support strong writing instruction. WriteSteps will be both presenting and exhibiting at the Association for Supervision and Curriculum Development’s Annual Conference. Attend Kresta Byington’s presentation, “Ready, Test, Score! Essential Tools for Common Core Writing Success from Chauncey Davis Elementary” on March 22 at 8:00 A.M.
Say hello to National Presenter Kim Gates at the Michigan Reading Association Conference in Grand Rapids, MI. Stop by the WriteSteps booth to enter for your chance to win a free one-year trial of eWriteSteps!